Bleeding Heart (Dicentra spectabilis): growing, planting, caring. An easy ornemental herbaceous, loved for its funny-looking flowers! 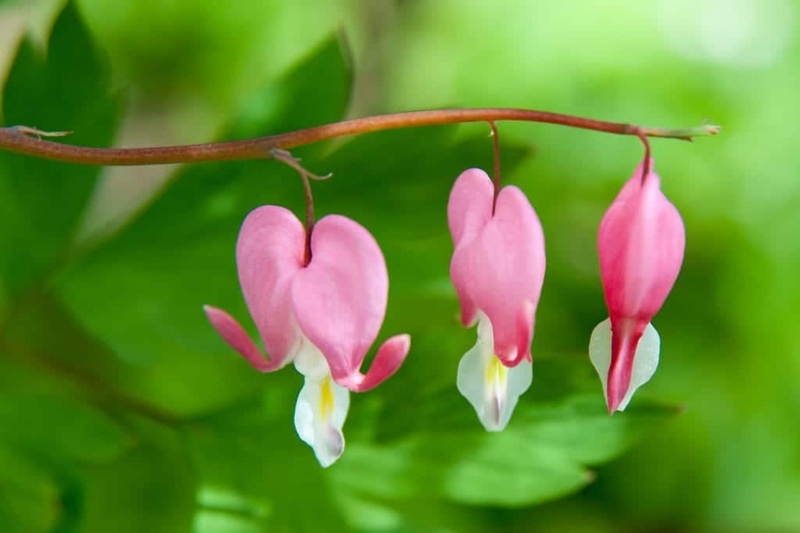 Dicentra spectabilis (now listed as Lamprocapnos spectabilis) - the bleeding heart - is a species of flowering plant in the poppy family Papaveraceae native to Siberia, northern China, Korea and Japan. It is the sole species in the genus, and valued in gardens and in floristry for its heart-shaped pink and white flowers, borne in spring. It is a rhizomatous herbaceous perennial growing to 120 cm (47 in) tall, with 3-lobed compound leaves on fleshy green to pink stems, and arching horizontal racemes of up to 20 pendent flowers with bright fuchsia-pink outer petals and white inner ones, strikingly resemble the conventional heart shape – hence the common name. The pure white-flowered 'Alba', somewhat more robust than the species, is a popular cultivar. Recognizable by its very decorative pink and white flowers, the bleeding heart - Dicentra spectabilis L. of his scholarly name! - is a perennial of the family Papaveraceae - cousin of the poppy! Plant Dicentra spectabilis in spring or fall for items purchased in buckets, in fresh and draining soil in the sun or semi shade. Prefer planting in the fall to promote rooting before winter. If you plant in the spring, avoid periods of frost. It may be necessary, when growth begins and during flowering, to sprinkle copiously the bleeding hearts-in a well-drained soil. For potted bulbs and indoors, water weekly during the growing season. In March, it is possible to multiply the dicentras by dividing the tuft with a spade. Be careful though, only make this on fairly solid plants: the rhizome is brittle and quite fragile. Feed the soil by adding compost, or use a liquid fertilizer just after flowering.